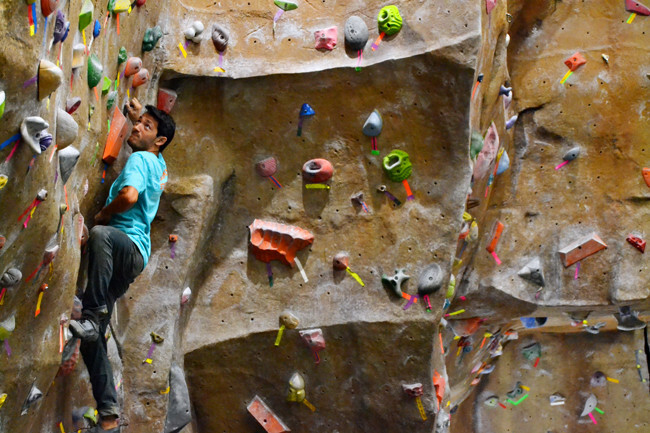 Neuroscience junior Colton Janysek climbs the rock wall in Gregory Gymnasium Wednesday evening. Janysek meets with his friends weekly to climb. Dell Miracle Kid, Marley, removes the hospital bracelets worn by Texas THON volunteers during the closing ceremony Saturday. More than 100 volunteers — including superheroes such as Batman, Superman and Wonder Woman — raised about $36,000 Saturday at Gregory Gymnasium for the annual Texas THON. In its 11th year, the Texas THON is a philanthropic event produced by UT students where volunteers raise money by pledging to stand — literally, without sitting — for 12 consecutive hours for children in need. All proceeds go toward the Dell Children’s Medical Center of Central Austin. The organization conducts fund-raising throughout the year, which culminates in a day filled with live entertainment, free food, games and dancing. Texas THON is one of many similar events held at universities across the nation to raise money for Children’s Miracle Network hospitals. In her Batman costume, executive chairwoman for Texas THON Caitlyn Leal said she felt the event was a success for the Dell Miracle Kids. The theme of this year’s event was “Super Heroes Stand 2013,” where volunteers and Miracle Kids dressed up as their favorite superhero. Texas THON invites Miracle Children to speak about their experiences at the event. Math junior Lisa Huynh said hearing those stories serves as an inspiration to her to “stand” for them. Marley, a Miracle Kid, was one of the children that spoke at Saturday’s event. At the age of five, Marley was hit by a vehicle that affected her ability to walk. During the aftermath and her recovery, she stayed at Dell Children’s Medical Center. Marley and all of those who participated in the Texas THON wore hospital bracelets with the name of different Miracle Kids on each bracelet. At the end of closing ceremony, the volunteers gathered in a circle to have their bracelets cut off their wrists to symbolize when a Miracle Child can leave the hospital. Marley walked, on her own, around the circle to cut over a hundred bracelets off the wrists of UT students and other volunteers. Published on February 18, 2013 as "Students stand 12 hours to support Miracle Kids".